Assistant professors Nicole Miller, Bethany McKissick, Jessica Ivy, and Kelly Moser of the Department of Curriculum, Instruction, and Special Education at Mississippi State University believe that cooperative grouping can be successfully used in the middle school classroom to generate greater engagement and meet both the students’ academic and social needs. The authors examine cooperative grouping specifically in the context of inclusive classrooms as, according to the National Center for Education Statistics 2010 report, 57 percent of special needs students are integrated into general education settings, which “further diversifies the student makeup in the classroom.” In this paper, a literature review is presented, but it’s unclear whether further study was conducted. When it comes to forming groups, the authors state that heterogeneous grouping (putting together students of various ability levels) is considered more beneficial than homogeneous ability grouping (grouping together students of matching ability levels). The latter can put emphasis on “ego-focused learning goals” — with students trying to one-up their peers or playing the comparison game — which negatively affect students’ motivation and engagement. The former is less competition-driven and supports acquiring “non-target information through observational learning” — in other words, students learn by watching and interacting with each other, without direct teacher instruction. The authors cite studies that show heterogeneous grouping benefits students at either end of the performance spectrum (low- or high-performing students); in contrast, “average” students perform better in homogeneous groups. 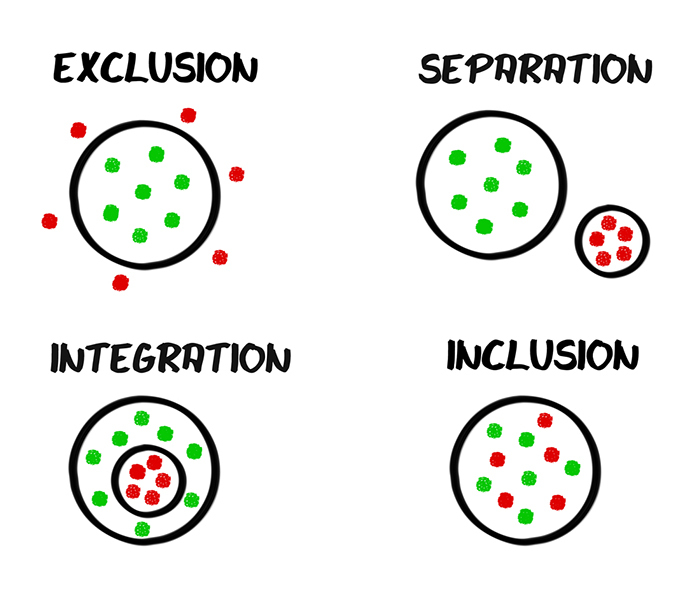 Hence, heterogeneous grouping is the best option for inclusive middle school classrooms. In regard to timing, tasks should first be broken into chunks of 5 to 7 minutes to get students used to staying on task and working without teacher interaction. Groups of four students constitute the best option. Teachers can first put students in pairs, then triads, then groups of four as students learn to work together. The authors state that “for every student in a group that struggles or requires remediation, there [should be] a higher performing counterpart.” Teachers should also avoid putting more than one student with special needs on the same team. In order to promote individual accountability and facilitate productive group work, every student should have both an academic and a managerial role within their team. The article provides additional consideration for heterogeneous grouping in the inclusive classroom. On one hand, teachers should make sure the class material is accessible to all students. For example, pictures (ideally concrete or realistic) should be provided for every new vocabulary word in order to promote vocabulary retention — a practice that benefits all students. On the other hand, teachers should include alternative ways to demonstrate understanding, like relying on “performance-based tasks rather than filling in a worksheet, writing a paper, or other written demands.” A choice-based approach where students are allowed to choose between multiple ways to show their understanding promotes autonomy and differentiated learning. A final recommendation for effective cooperative grouping is to include open-ended problem solving where students must depend on one another. The four-clue group task activity is put forward with this goal in mind. This strategy is designed to provide each group member with a specific clue that they cannot trade so the whole team must communicate and work together to solve the problem. Remediation and enrichment clues can also be included as needed: Teachers should guide students in their reflection without providing direct answers. The authors conclude that cooperative grouping can be effectively implemented to provide quality education for all middle school students. However, teachers must ensure they know their students well in order to provide the best conditions and make the most of this method. Share your thoughts: How do you adapt group work to support learning for all students? Anne-Marie is a community manager at Classcraft. She enjoys playing video games and learning languages. Her love of languages has led her to teach French and work as a freelance copy editor.